A dengue virus vaccine was recently developed not only to prevent first infections, but to avoid severe disease that may occur upon second and third infections. This consequence, called antibody dependent enhancement (ADE), now appears to be caused by the vaccine itself. Primary dengue virus infection may lead to a disease that includes fever, headache, muscle and joint pain and skin rash. In about 1 in 10,000 infections, severe disease can develop which involves severe bleeding, shock, and hemorrhagic fever. In a secondary infection involving a different serotype, the risk of severe disease is much higher, approaching 1 in 100. Dengvaxia is the name of a quadrivalent vaccine that was designed to protect against infection will all four serotypes of the virus. The results of a phase 3 clinical trial indicated that immunization protected not only against primary infection, but also against severe disease. Dengvaxia was licensed based on data collected one year after administering the third dose in a phase 3 trial. Data continued to be collected on 32,568 vaccinated and control children 2-16 years of age, and examination of the results five years post-immunization reveals vaccine-enhanced disease in all age groups. We now recognize that serious dengue, defined as requiring hospitalization, has occurred in two populations: vaccinated seronegative children, and monotypic dengue virus immune children who received placebo. In the seronegative children, the vaccine acted like a primary dengue virus infection, causing severe disease after an infection acquired ‘in the wild’. In immune children who received placebo, a second acquired infection lead to ADE. The numbers are small but significant. For example, during year 5 after the third dose of vaccine, 295 of 20,439 children (1.44%) were hospitalized with dengue virus infection. Severe dengue was also observed during years 2-4 after the third dose. Considering that millions of children will eventually receive this vaccine, serious disease occurring at a rate of 1.44% is not acceptable. The only good news is that vaccinated dengue seropositive children were protected, albeit moderately, against severe dengue disease. Nearly all children who received Dengvaxia produced neutralizing antibodies against all four serotype of dengue virus – so why weren’t they protected from serious disease? It seems likely that antibodies do not provide protection against ADE – rather, CD8+ T cells protect against severe dengue virus disease. Why doesn’t Dengvaxia induce the protective CD8+ T cells? The epitopes recognized by these cells are located in nonstructural proteins that are not encoded in the vaccine. 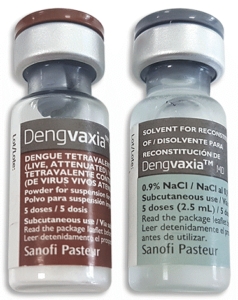 Dengvaxia is a recombinant vaccine comprising most of the proteins from the attenuated yellow fever virus vaccine, and the envelope glycoproteins from dengue virus. No dengue virus nonstructural proteins are encoded in the Dengvaxia genome. As Scott Halstead wrote, “The substitution of yellow fever non-structural proteins for those of dengue virus may have crippled Dengvaxia protective T cell responses to dengue infections”. Because Dengvaxia has been associated with ADE, the Philippines has withdrawn the product from use. Sanofi, the manufacturer of the vaccine, has noted that it should not be recommended to people who have not been infected with dengue virus. Stop using the vaccine altogether. Only give the vaccine to children of ages 15 years and older – as Brazil has chosen to do. These children are more likely to have already been infected with dengue virus. Only give the vaccine to dengue seropositive children. This choice would necessitate doing dengue virus serology on drawn blood. Despite this glum news about Dengvaxia, a vaccine that prevents ADE can probably be designed. A tetravalent candidate vaccine called TV003 has been developed by the NIH which is based on modified dengue viruses that do not cause disease. Immunization of volunteers with this vaccine, followed by challenge with infectious dengue virus type 2, gave complete protection in 100% of the individuals. Because TV003 is based entirely on dengue virus, infection induces the CD8+ T cells that protect against severe disease.